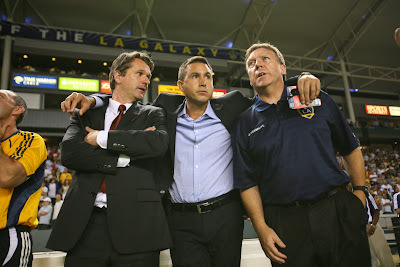 Paul Bravo (pictured above in between Frank Yallop and Trevor James during the 2007 SuperLiga Final), the Galaxy's Director of Soccer has left the club to become the Colorado Rapids' Technical Director, effective immediately. The LA Galaxy announced today that Director of Soccer Paul Bravo has left the club to join the Colorado Rapids as their Technical Director. The Rapids’ all-time leading scorer, Bravo played for the club from 1997-2001 before joining their coaching staff in 2002. “I want to thank Paul for his service and dedication to the Galaxy during his time with the club and wish him well in this next step of his career,” Galaxy General Manager and Head Coach Bruce Arena said. Bravo, 40, originally joined the Galaxy in June 2006 as an assistant coach under Frank Yallop. He held that position until August 24, 2007 when he was named the club’s Director of Soccer. In that role, Bravo was responsible for overseeing all technical aspects of the club, including scouting and evaluating players both nationally and internationally. He traveled to every continent in the world in this role, identifying potential players and meeting with foreign clubs. Prior to joining the Galaxy, the San Jose, Calif. native served as an assistant coach under former Galaxy player Jorge Salcedo at UCLA from 2004-2005, helping the Bruins win two Pac-10 Championships and a two-year record of 26-9-5. During his two years in Westwood Bravo, who scored once in four appearances with the U.S. National Team, recruited a number of players who have gone on to successful careers in MLS and Europe, as well as with the U.S. National Team, including Jonathan Bornstein, Benny Feilhaber, Kamani Hill, Marvell Wynne, Sal Zizzo and many more. I'm not complaining. If there's more changes and updates... Keep it coming! Wish Paul all the best in Colorado in his new role! REMINDER: Can the blog please let let us know who all are going to be attending the 2009 MLS Combine in Ft. Lauderdale, FL??? What about player trades? Any news/updates there?